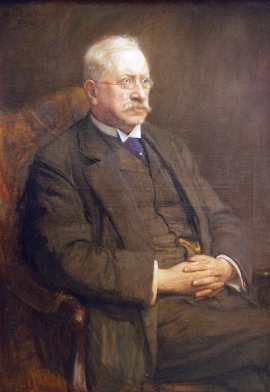 When Abraham Bredius died in 1946 at the age of ninety, he bequeathed his vast collection of more than 200 paintings to the municipality of The Hague. At his departure to Monaco in 1924 he had turned his large house at Prinsengracht 6 in The Hague into a museum. Until 1985 his collection of paintings, drawings, antique furniture, silverware, cristal and china had been on view for everyone. When the museum was closed the collection went into depot, but in 1990, on the initiative of a number of The Hague art lovers and with the support of sponsors, Museum Bredius opened its doors again, this time at Lange Vijverberg 14. At present the restorationprogramme is almost finished, so that the largest and the best part of the collection of paintings can be shown to the public in all its colour and lustre with which it adorned the walls of the first owners three and four centuries ago. Bredius’ furniture and applied art were also returned to the museum, so that the domestic atmosphere of the place was retained. Abraham Bredius was born in Amsterdam on the 18th of April in 1855. He was the only child of Hendrika Hillegonda Brink (1814-1865) and Johannes Jacobus Bredius (1808-1894), who descended from a rich family of gunpowder manufacturers. Although his father wanted the son to go into business, Abraham Bredius was much more attracted by music. When it became clear that Abraham would never have a career as a concert pianist, his father comforted him by sending him on a tour of Italy in 1878. There his interest in visual art turned into a passion for life. From that moment Bredius was one of the first Dutchmen to devote himself to the study of 17th century Dutch painting. And his articles on painters, musea and exhibitions were published in magazines at home and abroad. Avidly Bredius studied records in archives for years and years, he combined thorough source research with style-criticism, thereby laying a foundation of knowledge of many major and minor 17th century painters. Bredius mainly published his ‘archiefsprokkelingen’ (‘archival gleanings’) in the magazine Oud Holland. Besides, his seven-volume Kunstler-inventare was published between 1915 and 1922 containing a hoard of archival data. The oeuvre-catalogues of his two favourite painters, Jan Steen and Rembrandt, appeared in 1927 and 1935, respectively. When in 1985 the municipality was forced to close Museum Bredius, a number of The Hague art lovers united to revive the museum. Money was needed to get things started up and new premises would have to be found. A significant part of the funds was raised by a tour of the collection through America and Japan. With the support of sponsors the museum could open its doors at the Lange Vijverberg 14 in The Hague in 1990. The Stichting Bredius Genootschap (Foundation Bredius Fellowship) was established in 1985, aiming to make dr. Abraham Bredius’ collection accessible to the public, maintain the collection and organise exhibitions. The foundation consists of the board: there is no paid curator nor a paid director. And yet in the past few years the foundation has managed to embellish the interior of the museum, restore paintings and frames and organise more than 15 exhibitions, some of which with publications. The board is very grateful to the sponsors, without whom all that would not have been possible. Museum Bredius used to be situated in the previous residence of its founder, dr. A. Bredius, which was a 17th century patrician house on the Prinsegracht. The building which houses the museum nowadays dates from the mid 18th century. The gables of the adjacent premises on the east, numbers 15 and 16, clearly show the common origin of the three houses. However, the history of the location dates back a lot further. Shortly after the establishment of the countship in The Hague, Vijverberg and Voorhout became the preferred residential areas for the court dignitaries, which explains the distinguished character of these lanes. In the 15th century the houses that were located at the present-day numbers 14, 15 and 16 belonged to prominent families. In 1652 Frisian stadtholder Willem Frederik van Nassau established his court there, which was proof of the prestige the Hague held for this provincial functionary as the seat of the States General. As the regents had a strong aversion to the stadtholdership, it would not be until 1747 that Willem Frederik’s great-grandson Willem Karel Hendrik could be appointed as stadtholder Willem IV of Holland and the other provinces. Obviously, for generations the Frisian stadtholders had not had their true interests in The Hague. The court at the Lange Vijverberg with its imposing and numerous halls and rooms was maintained, but barely used. Its rather neglected condition appears from an inventory from 1711: threadbare carpets in His Highness’ wardrobe, broken mirrors in the antechamber and front room, old and worn furniture in ‘Princess Marie’s’ room, worn wallpaper in the noblemen’s dining-hall. Once the Frisians had been appointed stadtholders of Holland, they were not interested in keeping up the dilapidated court at the Lange Vijverberg. In April 1755 the premises were sold by auction at f 28.000 to the wealthy Manuel Lopes Suasso, whose father was rumoured to have lent Willem III two million guilders blindly to finance his passage to England. The big old palace was not fit anymore to be dwelled in or exploited, so Lopes Suasso had it demolished and commissioned the three new symmetrically grouped houses as we know them. On the basis of style-critical arguments art historian Ozinga concluded in 1936 that they were designed by Pieter de Swart. The architect was employed by the stadtholder, but also built the Koninklijke Schouwburg (Royal Theatre) and the former palace at the Lange Voorhout. The design of the three houses at the Lange Vijverberg reflects a more sober version of the grand and elegant Louis-XV style so characteristic of his work. For a long time the owners-residents belonged to the nobility and patriarchy. 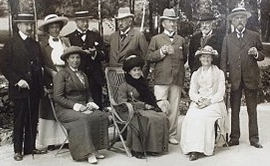 In 1936 the premises were bought by Frits Lugt. With his friend, architect Dirk Slothouwer, he renovated the place and made it habitable again. Just like dr. A. Bredius, Lugt was a pioneer in archival research, for which he had displayed a distinct interest at a very early age: at the age of ten he had founded the ‘Museum Lugtius’, ‘open when the director is at home’, i.e. is not at school. He acquired his knowledge working for the auction house Frederik Muller. Later he published standard works such as the Répertoire des catalogues de vente, in which he classed 60.000 catalogues of art auctions. The Rijksbureau voor Kunsthistorische Documentatie (National Office for Art historical Documentation) owes to him a collection of 22.000 auction catalogues and 130.000 photos. Besides, Lugt was an important collector of drawings and prints, which he kept in his house at the Lange Vijverberg. In 1939 he bought the house at number 15 from jhr. mr. L.P.M. Michiels van Duynen for f 90.000. When he had returned to the Netherlands after the war in 1945, he intended to put the premises at the disposal of the French embassy in exchange for a good old house in Paris. To safeguard his collections he established the Fondation Custodia, which in 1949 became the owner of the two houses at the Lange Vijverberg. In Paris, where he had been living since1931, Lugt took the initiative to found the Institut Néerlandais, the future home of his collections. After the acquisition of the buildings at Rue de Lille 121 in Paris in 1953, the premises at numbers 14 and 15 were sold at f 400.000 to the municipality of The Hague, which was looking for a better location for Museum Bredius. As there was much opposition to the intended transfer of this collection, the museum was to stay at its location on the Prinsegracht. 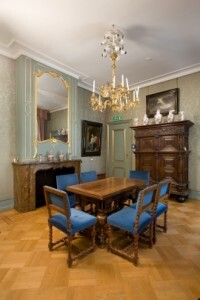 The premises at the Lange Vijverberg were assigned to the historic costume collection, which resided in the attic of the same Museum Bredius, waiting for a more suitable accommodation. That collection was based on the collection the municipality had bought from actor Cruys Voorberg in 1951. In the following years the Nederlands Kostuummuseum (Dutch Costume Museum) kept expanding, so that in 1975 the adjacent premises of number 15 were added to the museum. When the costume museum had moved into the Gemeentemuseum, the municipality of The Hague decided to sell both houses in 1988, as they were unoccupied. 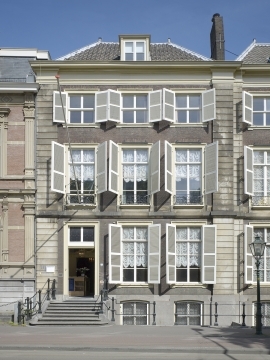 In 1990 sponsoring enabled Museum Bredius to move into number 14, so that at last a representative home had been found for the collection Bredius at a historic location in the centre of The Hague. This text has been slightly adapted from Museum Bredius: catalogus kunstnijverheid, Zwolle 2011.